The 2008 Platinum Proof Britannia Set is the second Britannia set minted by the Royal Mint in platinum. The first was in 2007 and up to date of this article no others have been issued, so Platinum Britannia’s are quite rare. Each reverse has a standing figure of Britannia as designed by John Bergdahl. Britannia, together with a combination of trident, Union Jack shield and lion are all symbols of Great Britain, devised many centuries ago to signify that Britain ruled the waves (as it did indeed in those days with the most powerful navy in the world). Britannia has been used on several other British coins. Platinum is actually an element with symbol Pt and atomic number 78. It is a dense, malleable, ductile, highly unreactive, precious, silvery-white transition metal. A non-expert may mistake the coins as silver, which would be a costly mistake as Platinum is considerably more expensive. Platinum is denser and more rare than gold, although over the years the price between the two have fluctuated in each others favour. The obverse of each is Ian Rank-Broadley’s portrait of Queen Elizabeth II. The four coins were originally presented in a Royal Mint wooden presentation case, with outer black card box, complete with a certificate of authenticity. Only 250 sets were authorised. Known by this name as an image of Britannia is always on the reverse, the coin has been minted in silver since 1997. The image of Britannia on the proof version is changed every year, although odd years see Britannia standing and even years see her sitting. The image may be different on the proof and Uncirculated versions of the same year. Gold Britannia sets are issued on a regular basis. They are available as 3-coin, 4-coin and 5-coin gold sets as well as individual coins. 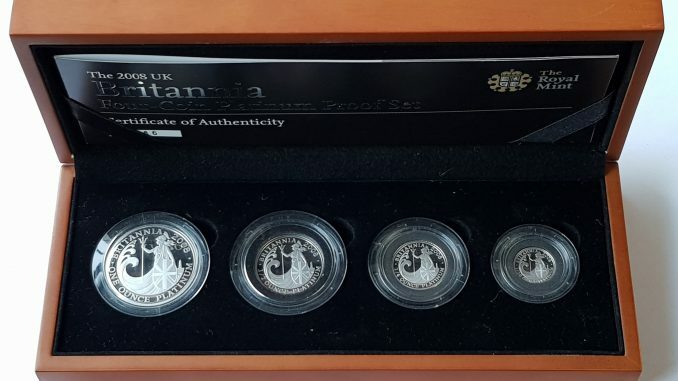 The 2008 Platinum Proof Britannia set shown was being offered for sale by M J Hughes Coins. What is a Mercury Dime/Winged Liberty Dime?